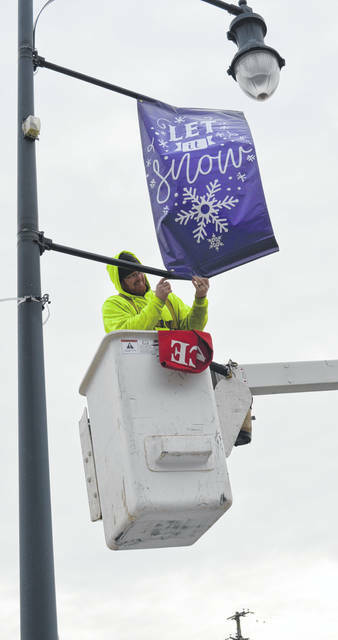 In an effort to add a little splash of color to the downtown during winter’s gray days, a City of Wilmington crew was hanging seasonal banners Monday to the street light poles. The City paid for the banners using hotel lodging tax funds. In the photo, Seth Horsley of the Wilmington Maintenance & Repair/Streets Department installs a banner on the courthouse block of Sugartree Street. The message “Let it Snow” holds some irony for Horsley — he’s one of the City employees who salt and clear the streets when winter weather strikes.